There are plenty of pesky animals intruding on home gardens, but one creature nobody wants to shoo away is the gorgeous hummingbird. Many people pick out plants specifically to attract the tiny, nectar-sucking speed-flappers. Hummingbirds are able to assess the sugar content of nectar and prefer flowers with higher sugar percentage, so there's a limited selection of plants that will invite them to your yard. 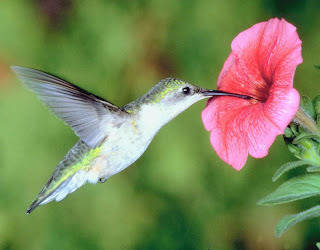 Hummingbirds are "suckers" for Morning Glories and other sweet flowers. Whispering Hills stocks many of these varieties. Call 847-658-5610 for more information.